Google+ has taken the internet world by storm and there are several reasons for it. It has covered all the facets of internet usage, including social community. 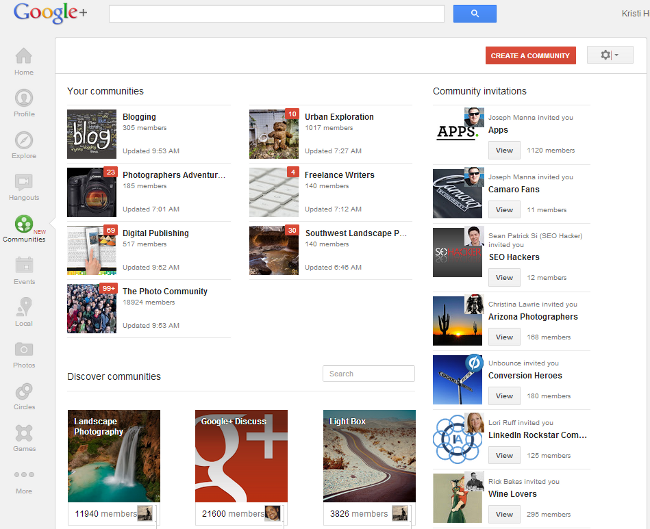 In answer to various social networks like Facebook or LinkedIn, it has released Google+ Communities. This is also a social networking site which helps the users stay in touch all over the globe. It was just a matter of time and within a short span of 24 hours, the number of social networking users at Google+ Communities sky-rocketed from zero to many thousands. The next week saw a whooping number of 21,000+ members. This shows the eager participation of the users from across the world. 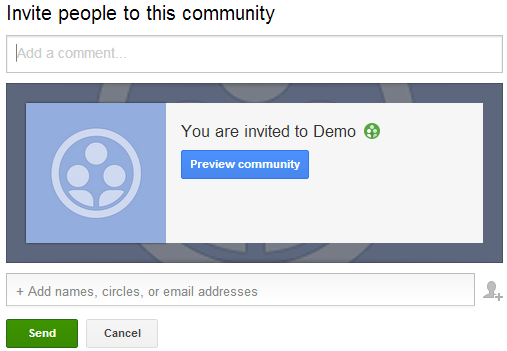 If you have a Google+ Communities account well in advance then you will face no problem in using this networking site. If you have a personal profile in this social networking site then half of the battle is won. 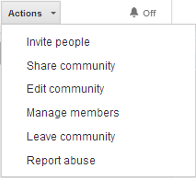 You simply need to open you Google+ Communities account from the left-hand side menu now showing as “Communities” tab and start searching for communities of your choice and which suit your interest the best. There are numerous communities available at the click of a button. You can click on the communities that are most apt for you. For this, you need to simply click on “Join Community” button. If the community that you wish to join is one that moderates membership then you will be required to click on “Ask to Join” button instead of the one mentioned above. This will require you to wait for approval before you can begin. Once you become a member, you can easily post your entries to the community that you have chosen. For this, you will require to use the very status update box which you have been using since so long. The main difference is lies in the fact that here, you will have to select the topics that are within the community where you will be posting your entry. You must take note that when you post any entry to a community, the post will feature on your profile also. If the post is from public community then it will show on the public profile and if it is from a private community, it will be visible only to the members of the community. If the members from the same community browse through the social networking site, the entries from the other members will be visible to them. On the other hand, users from other communities will not be able to view them. When you become a member of the community then you can access the Actions menu as well as On/Off toggle that will give the notifications. These areas can be easily used to keep a tab of emails from the communities. This will also enable you to share the specific community on your profile too. Or if you want to leave a certain community then you can easily do so. 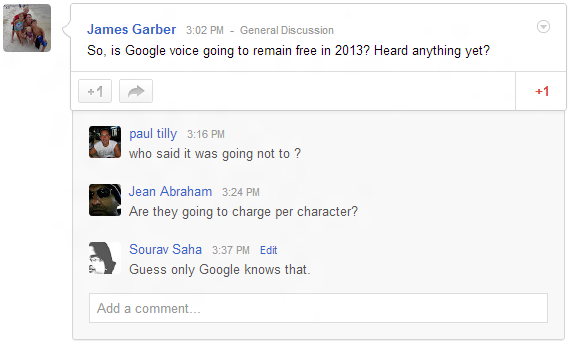 Hence you get numerous options when you are on Google+ Communities. Blogging: A community which comes under this classification means that it deals with general blogging, tips, WordPress, discussions, etc. There are more to this and the users get ample choices when blogging. Guest Blogging: This community is dedicated to connecting blog owners and guest bloggers. Freelance Writers: This community is for users who write for blog either online or offline. These writers are paid for their services. Community Moderators: Those who are moderating various communities for tips and other information fall under this category. Social Media Hub: This community is dedicated to the social media marketing. Users who are connected with social media marketing fall under this category. Basically speaking, a community can be about anything that one is interested in. There are countless categories that are created by users, day in and day out. You can easily find one that suits you interest the best but if by any chance you fail to locate one, you can easily create it. 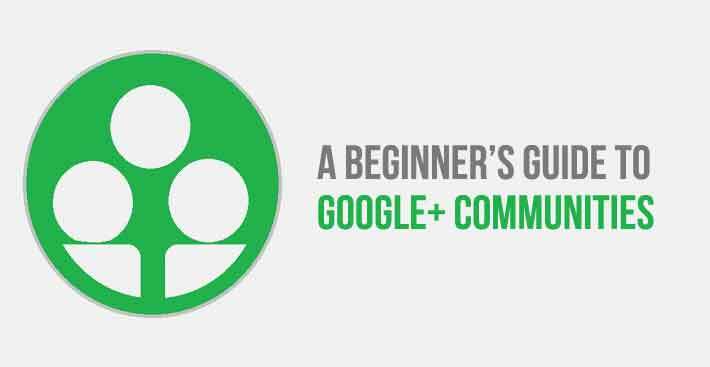 Though Google+ Community is rampant with numerous communities which are dedicated to various interests, there can come a time when you feel that you are unable to locate a community which suits your needs. Or if you feel that you can do a better job with a new community than with an existing one, you can easily create a community according to your needs and requirements. For this, you will need to click on the “Create a Community” button or you can directly click this link: https://plus.google.com/communities/create. This will help you in creating a community which is exactly like a community one that you need. Once you have decided that you want to create a community, you will have to make many choices. The first decision in creating a community involves whether you want to make it public or private. If you have chosen public then users from different communities will be able to view your entries. 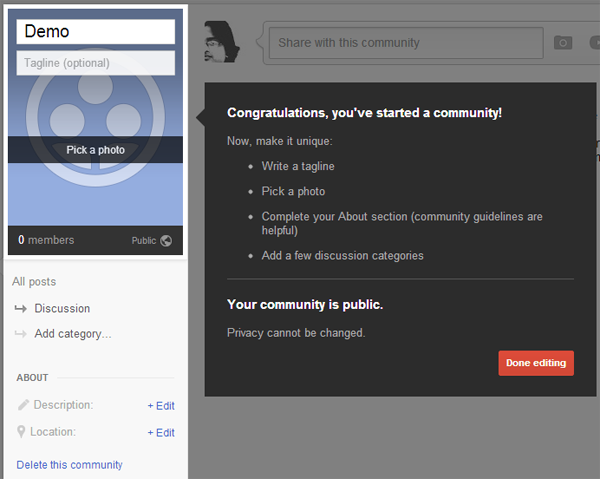 But if you have private on mind, the users from your selected community will be able to view your entries. Hence it is up to you to decide whether you blog posts will be private or public. This choice should be made according to you personal preferences and professional demands. 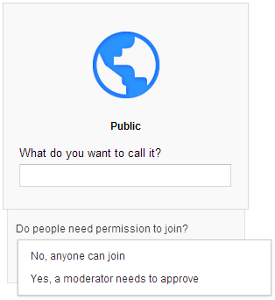 If you select public as option, you will see the option that requires you to give the name of your community and then you will be asked whether the people joining your community will need a permission or not. 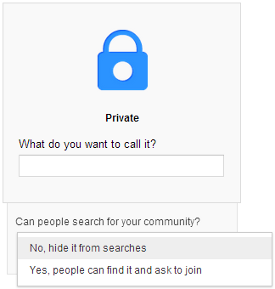 In case you select private as the privacy option, you will be required to hide it from the search and hence it lies in your hands to promote your community. The responsibility is entirely yours to get publicity for your community. After you have decided which privacy option you wish to choose, you must pay attention filling details about your community. The more details you give about your community, the better participation you are likely to get. Tagline: This is a short sentence throwing light on the target of the community and what it is about. This tagline will be visible in the search results. Photo: This is an image which is related to your community and it features in the search results. Categories: This keeps the categories organised. About: This includes the main description of your community. This can throw light on the goals of the community and what it is about. Location: If you community covers a specific location then you can add your location here or else there is no harm in leaving it blank. Once this is done, you can easily invite the other users to join your community. In this way, you will be able to invite the people personally to your community but if you want to share your community with other public, you need to make use of the feature “Share Community” which comes under Actions. The Actions menu includes various options like Edit Community. Change details, adding categories, etc. There are numerous other tasks which the moderators can perform with the help of Actions Menu. 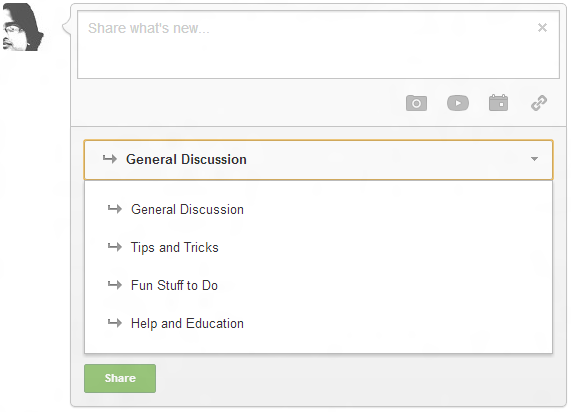 Have you used Google+ Community so far? 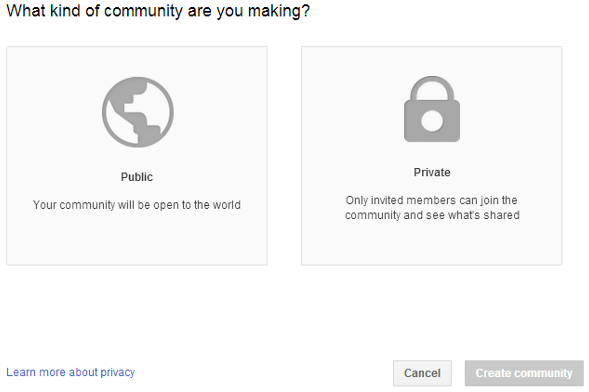 Have you created any community in Google+ Community? What kind of experience have you had with it? Please share your experience with us.